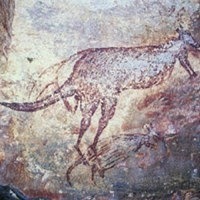 Dating, Styles, Types of Aboriginal Rock Paintings, Western Australia. See also: Bradshaw Rock Paintings. (after 25,000 BCE) Kimberley region. The Kimberley region, which occupies the most northern part of Western Australia, is home to an estimated 100,000 images of Aboriginal rock art, from the Paleolithic to the Modern era. This prehistoric art includes cave painting and ancient engravings on rock faces throughout the area, dating back to the earliest time of human habitation. 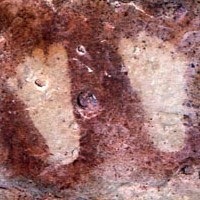 However, as in the case of Burrup Peninsula rock art to the west and Ubirr rock art to the east, most of Kimberley's ancient art remains uncatalogued and undated, and the little scientific dating that has occurred has failed to pinpoint any artwork that predates the Last Glacial Maximum, around 18,000 BCE. As it is, the oldest Stone Age art in the Kimberley are cupules, dated to 17,000 BCE, and a Bradshaw tassel painting dated to at least 15,500 BCE. However, in view of the recent discovery of the Nawarla Gabarnmang charcoal drawing, carbon-dated to 26,000 BCE and currently Australia's earliest art, it seems probable that older works in the Kimberley will be found before too long. After all, if Oxford Professor Stephen Oppenheimer is correct in saying (in his book "Out of Eden") that Modern Man crossed the Timor Sea to get to Australia between 65,000 and 70,000 years ago, then surely he must have started painting pictographs or scratching petroglyphs by 30,000 BCE, if not sooner. Modern humans were carving prehistoric sculpture and creating hand stencils in European rock shelters as early as 39,000 BCE, so it seems only reasonable to suppose that Aussie moderns did the same. To see how Kimberley's rock art fits into developments around the world, see: Prehistoric Art Timeline (from 2.5 million BCE). IMPORTANT NOTE: The recent U/Th dating of Sulawesi Cave art (Indonesia) to 37,900 BCE has massive implications for the dating of Stone Age art in Kimberley, not least because Sulawesi forms part of the "land-bridge" used by prehistoric migrants from the Asian continent to Australia. Thanks to the archeological and anthropological research conducted by the Frobenius Institute of Frankfurt in 1938, the individual contributions of Dr. Helmut Petri, Agnes Schulz, Gerta Kleist, Patrick Pentony and Arthur Capell, as well as Dr. Andreas Lommel's work with the Unambal tribe, and the more recent investigations done by Dr. Grahame L. Walsh, Ian Wilson, Hugh Brown, Dan Clark and Leif Thiele, Kimberley's aboriginal art is gradually becoming more and more appreciated at home and abroad. The pioneering work of the late Dr Walsh (1944-2007), in particular, together with his books on aboriginal art, helped to raise the profile of Australia's ancient art throughout the world. Sadly, however, controversy has flared up recently over his unnecessary and unjustifiable view that Kimberley's Bradshaw paintings (now called Gwion paintings) were not painted by the ancestors of today's aborigines. As a result, we have tried to avoid mention of Dr Walsh's lexicon of terms in this article, preferring to use the term "Gwion", instead. We have however prepared a separate article on "Bradshaw Rock Paintings", using Dr Walsh's classification and terminology. Finally, we note in passing that, despite Walsh's international reputation as one of the leading authorities on aboriginal art, Wikipedia has been unable to compile a biography of him. He deserves better. Note: To compare Kimberley cave art with that of Africa, see the animal paintings on the Apollo 11 Cave Stones (c.25,500 BCE). In simple terms, there are two major traditions of rock art found in the Kimberley region of Western Australia: Gwion paintings (previously known as "Bradshaws") and Wanjina paintings. Gwion rock art is older and much more extensive, and appears to have evolved in a series of differing styles. Please note: all dates are approximate only. Not unlike Paleolithic art in Europe, the oldest art in the Kimberley region consists of petroglyphic markings, such as pecked cupules, hollows, and grooves - often in large numbers - as well as intricate stone arrangements. No one yet knows the meaning of these cultural marks. Simple pictographs, petrograms and petroglyphs were also made. This early phase is also known as the Cupule, Pit and Groove Period, and corresponds roughly to the era of Aurignacian art in Europe. The earliest Kimberley rock paintings are naturalistic, sometimes life-size, images of animals, fish, flowers and plants, along with some human forms typically painted in mulberry and red. Outlines are drawn using long flowing brushstrokes, with head, tail and limbs receiving a solid infill of colour, while the trunk is given an uneven, irregular infill. The last feature is why the era is also known as the Irregular Infill Animal Period. 'Positive' handprints and 'negative' hand stencils were also made at this time. 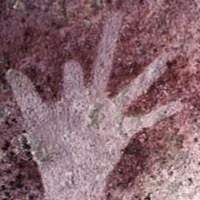 (Note: For the finest examples of Aboriginal finger fluting in Australia, see: Koonalda Cave Art c.18,000 BCE). NOTE: For the oldest and largest site of open air petroglyphs in Europe, please see: Coa Valley Engravings, in Portugal (22,000 BCE). Better known by the term "Bradshaws", Gwion rock art (also called "Giro Giro", "Djaeneka djaeneka" or "Kiro kiro" or "Kujon") is named after one of the Aboriginal beliefs in the Kimberley on where aborigines came from. This style of rock painting is best known for its graceful, long-bodied, elaborately dressed human figures, armed with a diverse range of instruments and artifacts, as well as boomerangs, spears, dilly bags and personal ornaments. Typical colour pigments used, include red, mulberry and very dark colours. (See also: Prehistoric Colour Palette.) However, Gwion painting embraces a number of distinct but overlapping styles - including Tassel Gwion figures, Sash Gwion figures, and Elegant Action figures, to name but three - which span the European phase of Magdalenian art. Gwion rock painting evolved gradually over a long period, and overlaps with its later variants: Static Polychrome and Painted Hand. This style of painting is characterized by groups of thin, static, dressed, stick-like figures, with headdresses, barbed spears and spearthrowers, which are meticulously painted in red and orange, with lightly applied white and yellow hues, creating the impression of unpainted sections. The idiom is believed to be a response to rising sea levels and changes in environment. Art from this period is also known as "Wararrajai", or "Clothes Peg Figures" and corresponds roughly to the era of Mesolithic art in Europe. Arguably the most diverse of all the styles, at least in terms of motifs used, Painted Hand art is typically applied with broad brush strokes superimposed over earlier paintings. The hand motifs used can have complex geometric designs. Overall, this style of art istremendously varied with bichrome and polychrome depictions of decorative objects, human and animal figures, and plants, as well as abstract signs including finger-dots, lines, and non-figurative motifs. This period is also known as "Clawed Hand" and equates roughly to the era of Neolithic art in Europe. Wanjina paintings are named after the explorer George Grey, who was the first European to document them during his travels in the Kimberley in the 1830s. In 1841, he published his account of them in his book "Journal of Two Expeditions of Discovery in North West and Western Australia". The Wanjina style of painting depicts the spirit ancestors of modern day aborigines in anthropomorphic (part animal, part human) form. In fact, Wanjina constitutes a continuous tradition which has lasted over the past 4,000 years. Wanjina images are characterized by halo-like headdresses over mouthless faces with large round eyes on either side of an oval-shaped nose. Unfortunately recent overpainting of earlier Wanjina pictures makes it almost impossible to follow the development of the style. This period is also known as the Polychrome Art Period.  For details of European Stone Age painting, see: Parietal Art.  For details of portable prehistoric carvings, see: Mobiliary Art.  For arts and crafts in the South Pacific zone, see: Oceanic Art.  For monumental stonework, see: Megalithic Art.  For more information about Aboriginal art in Australia, see: Homepage.